The time continues to fly by as I sit tucked into a fold of the rolling hills here. 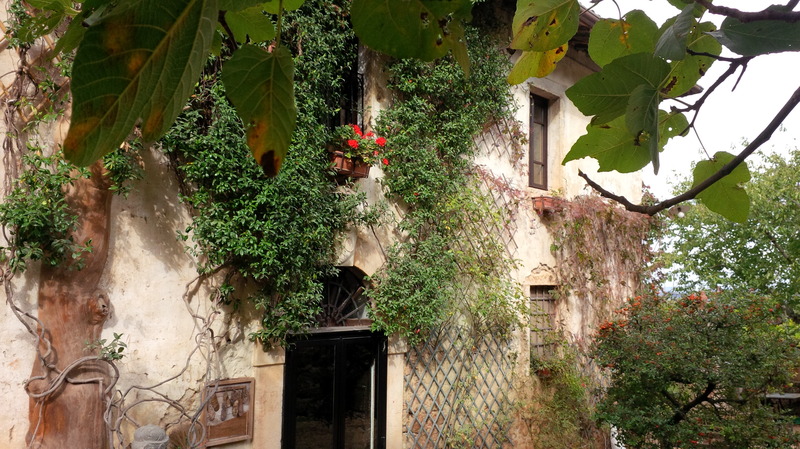 I have been in Italy six weeks already, all but one spent here at Ebbio, my little Tuscan retreat. This used to be a volcano. I feel a powerful energy here and wonder whether it is the volcanic past. Or perhaps it is a personal connection. I have grown so much here. But I am quite happy not knowing. This place feels somehow like a cocoon to me – a womb. I curl up whenever I return, grateful for its nurturing. We have had some beautiful days this week, though the weather is now becoming cooler. I am still wearing my shorts out most mornings but I am also taking my sweater with me and often a little neck-warmer. Nonetheless I had a few afternoons of work where I had to take my sweater off due to the warmth. I have been in quite a little groove of late. A rhythm. The last couple of weeks especially. It has been nice. I thought I would have left the farm by now but I am no longer concerned about running around, quite happy right here. Perhaps my wanderlust is changing shape a bit? Mind you, I did buy a few more flights this week. I went into town for an hour of better internet and bought a flight to New Orleans a few days into the New Year. I will head down to celebrate the 30th birthday of a dear friend with several other friends. I will fly on to Ecuador from there, intending to set up shop for a stretch and see what I might be able to do with the story I have been living and writing over the past few years. I have been back into editing the story recently – much of it originally born here – as a part of my daily routine. I usually rise a bit before seven and head outside to pluck a lemon from the branches of one of our lemon trees. I bring it back to combine with a bit of ginger and honey (which a local friend collects and shares generously). This honey-lemon-ginger tea is a nice start to the day. I often check my email and look out over the hilly horizon as I slowly sip my way through it. At about eight o’clock I join Nirdosh, the matriarch of the farm, up in her home for half an hour of meditation, sometimes followed by more tea and visiting, or just restocking her woodpile for the day and carrying on. I follow that with a bit of muesli and banana, occasionally turning on the TV to ‘practice my Italian’ watching Walker, Texas Ranger (or whatever else may catch my eye). Then I write for three hours. There are little diversions here or there – picking up my guitar for a few minutes – but I have been generally quite disciplined the last couple of weeks. Mostly I have been getting reacquainted with the massive ocean of words that spilled forth well over a year ago, with the intention to rein it all in a bit (or a lot). I want to focus on the core of the story. After my writing I join the boys for lunch. Luca, who is our chef when yoga groups are here, comes in from helping Costel with olive picking to prepare lunch for us. His lunches are always incredible – almost always pasta and salad. He is a true Italian. His variety of sauces always impress. You can feel that he cooks with his heart, which makes a bigger difference than could ever be quantified. After a little post-lunch rest we resume picking olives for another couple of hours. Occasionally there is other work to do, like today, raking and burning leaves, trimming vines and collecting more walnuts. We will be done with the olives by Saturday. 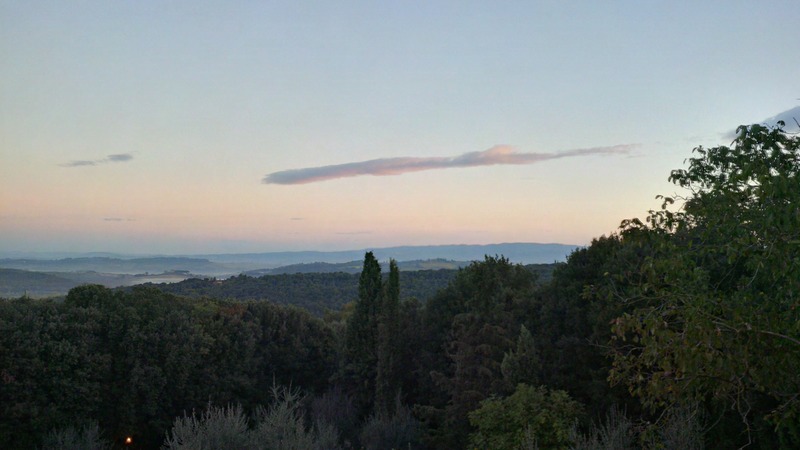 As the sun begins nearing the treetops on its descent, Costel usually calls it for the day, packing up the olive nets and heading off to feed the animals. I tend to play music for about an hour at this point. Last week I set up the drum kit and have been enjoying having it in the rotation. We also have a grand piano in the big yoga studio and a classical acoustic guitar on hand here. I brought my own steel-string acoustic from home. Overall, I play the piano the least and my guitar the most but I feel quite blessed to have so many options. Yesterday Luca ‘jammed’ with me on the drums for a bit, he tapping away on a large pot with a wooden stick. That was fun. Then it is off to the showers. The water can get really hot and I love this part of the day. Once I am freshened up I tend to prepare a little salad for dinner, with mixed lettuce and shredded carrot, adding some sliced mushrooms and diced peppers. I sprinkle a bit of salt and pour some fresh green olive oil overtop and wander down to my friend Franz’s vacant apartment to set up for my evening entertainment. He has a wide (and rather scattered) selection of DVDs. Among others, I recently watched Shine; I Love You, Man; Surfer Dude; Fantastic Mr. Fox; Captain America; Focus; Away From Her; Tintin; The Tourist; The Kids Are Alright; and Up In The Air. Before starting a movie, I usually crack a few walnuts (I have been up in the trees the last couple of days to knock the remaining walnuts down…as I am noticing the crates thinning a bit…) and mix them with some raisins, liking my dessert ready to go. Once my station is all set up I press play and enjoy my salad and dessert. I often supplement the walnuts and raisins with a few rice cakes and honey, and usually an apple to cap it all off. 🙂 I just may be a three-dessert kind of guy. After movie time I may glance at my emails again and play a bit of guitar as they load (the internet is really slow here), then I head down into the meditation hall for at least half an hour of nighttime meditation. Often more. One night this week I sat for almost two hours, diving very deep, one might say. It has been a very energetic part of my day. I often stop and stare up into space on my walk up to my house at this point, gazing at the stars (as long as they are not obscured by cloud), bowled over by wonder. Rico, the friendliest dog on earth, usually sits beside me as I do this. Then it is into my room where I write a quick journal entry and do a bit of yoga before sliding into bed, usually smiling. I tend to read a bit before falling asleep and sometimes listen to a bit of music on my iPod – little bedtime playlists. I love to scan my body as I lay in bed and feel the buzz of life coursing through every cell as I drift off to sleep. Then I rise and do it all again, amazed at how different it is every day. There is such a freshness to every moment. I feel like quite a lucky lad to be living here. However, I do wish I could scoot home (if only for a moment) to give my Mom a hug on her birthday – today is the day – but a virtual hug will have to do for now. I love you Mom! We just had a nice visit on the phone. It was great to connect that way. I hope you all have a lovely week and feel free to be the light you want to see shared in the world. Don’t let the darkness fool you, it’s all light in the end. It has been another beautiful week here on the farm. 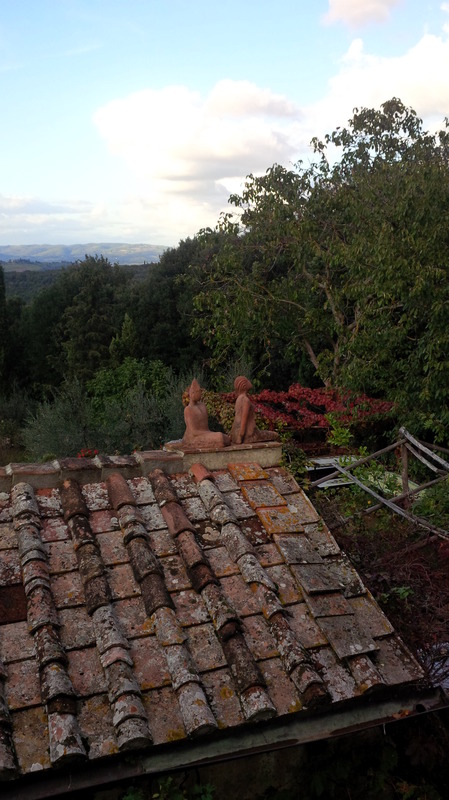 The weather has returned to ideal conditions, favourable for olive picking. It has been a pleasure to be back up in the trees. We were loaned two machines to help us pick, along with some better nets. The machines are like long, gyrating forks that jostle the branches and knock the olives to the nets below. A friendly farmer, Michele, offered us his tools while he caught up on a variety of other chores on the nearby land he tends. He even loaned us a worker, Federico, a young shepherd. I had never met a shepherd before – not knowingly at least. He was a nice young guy. Fresh-faced and wide-eyed. He stayed a few nights here in the ‘worker house’, joining us for meals as well as a few days of olive picking. We were very productive this week. We have already been enjoying the spoils of our labour. The freshly pressed olive oil is so delicious, with such a crisp and clear flavour, and a deep green colour. Apparently the leaves that mix in with the pressing process add to the green. The chlorophyll is still so fresh that it will take a few months before the green fades into the yellowish colour we tend to expect of olive oil. Whatever the colour, it is perfect for dipping fresh bread into at the moment. I have found myself smiling and laughing quite a bit this week. Sometimes quietly to myself and at other times howling with my friends here. As I work in the trees the peace of the countryside mingles with the peace within (ultimately blurring any distinction) and I find it so easy to breathe. I can feel peace and express it so effortlessly. It just comes bubbling up to the surface. Joy seems so natural. It is strange to me that so many of us let joy become so obscured in our lives, and so rare. So caught up in our ‘serious’ stories. We seem to have forgotten that we can be earnest without being serious. It feels to me like joy is the ground floor. It’s right here. I wonder what we are chasing up in the penthouse that is any better than this? I admit a view from up top is nice. I’ve been enjoying climbing the trees and looking around for a few moments at the rolling hills and golden light, the Cyprus trees and linear vineyards standing out in sharp relief. The trees are often fullest at the top, olives bunched together in great masses, and the picking is highly satisfying. The machines make quick work of it but I prefer to pick by hand up in the higher reaches of the trees, the branches supporting me with surprising strength. Sun setting on another day of olive picking. But things are shifting again on the farm. My friend, Franz, who has been running the farm for the past fifteen years, has gone off to Cuba with his wife, Molly, to organize a few yoga retreats there. They will be gone for about a month. Franz’s mother, Nirdosh, who owns the farm, is slowly taking the reigns back. She has a very different vision for this space than her son has implemented over the past decade and a half. It is a tender energy at times, here, as life moves through the friction of transition. Some of the other workers (one live-in and a few who come and go) are wondering what their place will be here moving forward. All parties are wondering about where loyalties lie, and where they should. I feel like a free agent here, my only loyalty to love (which is also truth, or presence), and I sense I am serving as something of a bridge between others here, supporting open communication and any necessary airing of concerns. Perhaps I am here to be a witness. I don’t need to know, though. Transition can be tough. That seems to be why so many of us hold on so tightly to our various life rafts. I see it at work in myself, every day. But I also have developed such a strong commitment to truth, through presence, that I am constantly leaping from my own ‘safety’ (or insulation) into the mysterious heart of life’s uncertainty. It is very raw and vulnerable out here. But unmistakably real. That is the attraction. No more hiding. Yet quick forgiveness when old patterns pop up. Breathe in and recommit. Release. Life, when allowed, is a natural disentangler. But it first forces us to face our entanglements, not an altogether enjoyable ride. But it is ever-so worthwhile. And ultimately unavoidable. This is the process of liberation. This is how we become free of our limitations, by recognizing them for what they are. Perspective comes through the clear sight of all we are afraid of, all we are avoiding. We are nudged (or jolted) back to our true ground, seeing the impermanence of all we had attached ourselves to. The very ‘act’ (or ‘experience’) of truly clear sight implies that everything seen cannot be who we are. Consider this. There is a gap here – perception itself. It feels paradoxical. Can a tongue taste itself? No need to figure any of it out. It is not to be ‘understood’, not in the way we often try to ‘understand’ things, anyhow. But it can knock the cloud from under us and see us fall back to the ground of reality. This ground cannot be conceptualized. It seems to be ever-unfolding. It allows no pause, and yet invites full rest. So come back to yourself and rest a moment. Take a breath. See where it may take you. I guess I’ll come back to myself now and wrap it up for this week. 😉 I plan to check in again in about another week. I will likely still be here on the farm. But who knows? Just a very quick one today. The light is fading from the sky and I am still hoping to sit out on a stone wall and crack open a few walnuts and almonds for a bit. I was up in the olive trees again today after about a week off the job. We had a few days of rain here at Ebbio, which effectively stops all olive picking. But today was gorgeous and the rest of the week is supposed to be much the same. I thought at this time last week that I might be in Munich by now. But not yet. We shall see. I was due to visit a shaman in the north of Italy with my friend and host here but apparently some snow fell and he was not so keen on the outdoor ceremony and camping with limited supplies. My idea was to hop north to Munich from there but now it looks like I will be here at least another week helping with our olive harvest. I can’t say for sure at the moment if I will even head north anymore. Part of me is more keen to head south for the warmer weather. However, we have another yoga group booked in a couple of weeks and I may just hang around to help out with them. Front of the big house. Either way I am in good shape. I have been enjoying the alternating days of labour and leisure here. I went to the spa yesterday with my host and his family. My fingers were well pruned after a day in the thermal springs. It was a most relaxing day. Then I sat to send some love and ‘good vibes’ to my family who were gathered for the burial of my grandfather. Even after more than two years since his death, I felt his presence very strongly in my heart as I opened myself to gratitude and warm memories of him. It is endlessly amazing how powerful love can be. I wish I could have been with my family in person, also, but I was happy to support in spirit. Grandpa would understand that I have to go on living, wherever it may take me.